It’s been a week since President Trump announced he was pulling the U.S. out of the Paris Agreement. In that time, a remarkable transformation has taken place. As the federal government abdicates its responsibility to address climate change, a groundswell of support has sprung up at the state, city and corporate levels. Those sub-national actors are making the case on the international stage that the U.S. will meet its Paris Agreement commitment. 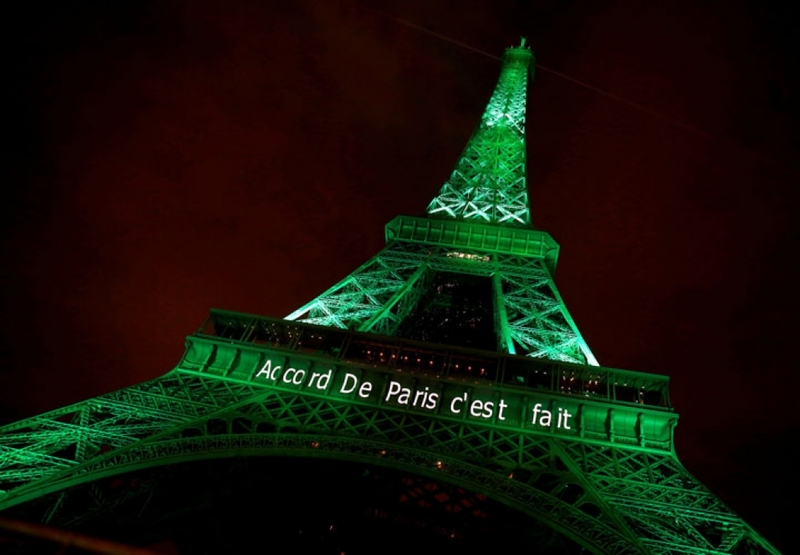 The Eiffel Tower is illuminated green with the words “Paris Agreement is Done” to celebrate the pact on Nov. 4, 2016. That includes a first-of-its-kind effort called America’s Pledge, spearheaded by Bloomberg Philanthropies, that’s been dubbed a “societally nationally determined contribution.” States, cities and other groups can sign on to meet the U.S. pledge to the Paris Agreement of reducing carbon pollution 26-28 percent below 2005 levels by 2025. David Hart, a political scientist at George Mason University, said that the new initiative bears some similarity to the 1980s anti-nuclear movement when cities and states declared themselves “nuclear-free” zones, but it’s the only time he can recall sub-national action in the U.S. being linked to an international treaty. The pledge can’t take the place of the federal government’s commitment, but it’s part of a huge shift in the climate landscape. The speed with which the shift has happened has put the movement in uncharted territory on the international stage and legally. The United Nations Framework Convention on Climate Change (UNFCCC) is responsible for tracking countries’ pledges and is working to figure out how to incorporate the sudden surge of local action in the U.S.
“We welcome this initiative because it illuminates just how much support there is for the Paris Climate Change Agreement across so many sectors of society in the U.S. and across the globe,” Nick Nuttall, a spokesman for UNFCCC, said. The current actions by states, cities and corporations have a high upside internationally. The U.S. is the world’s biggest historical climate polluter, and getting it on board was crucial for the Paris Agreement to come to fruition. Having it leave the pact could jeopardize the agreement even though big players like Europe and China have reaffirmed their commitments. America’s Pledge sends a strong signal to any wavering countries that the U.S. may formally be leaving the agreement, but it’s not going away. California Gov. Jerry Brown meets with Chinese Minister of Science and Technology Wan Gang at the International Forum on Electric Vehicle Pilot Cities and Industrial Development in Beijing on June 6, 2017. While Bloomberg Philanthropies is hosting America’s Pledge, Pope said it’s not alone in recognizing the need for non-federal leaders to step into the power vacuum left behind by the Trump administration. A coalition of more than 1,200 local governments, corporations and universities wrote an open letter to the world about their commitment to the pact; the mayors of Paris and Pittsburgh penned an op-ed in solidarity; and Hawaii is now the first state to sign a law to commit to meet the U.S. Paris pledge. “People understand that if there wasn’t some response to what Trump did, American leadership would be badly compromised,” Pope said. States and cities have a lot of avenues to reduce emissions. There are already a number of ways local governments can address their carbon pollution, some that could yield unexpectedly large benefits and that are vastly different than what the federal government can do to reduce emissions. California, for example, has a waiver to set car pollution standards that are stricter than federal ones. A number of other states have adopted those standards, and automakers have had to respond by producing cars to meet them. Residential and commercial buildings account for nearly 40 percent of all U.S. energy consumption and represent another huge opportunity to cut emissions at the city level. 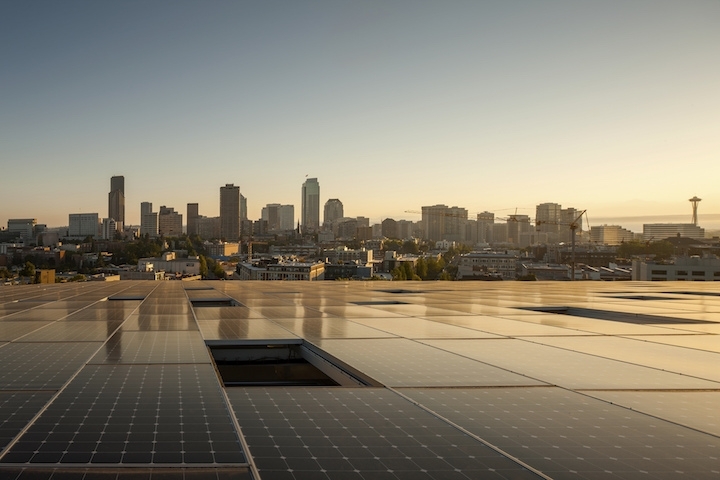 The Bullitt Center's rooftop solar panels reflecting the Seattle skyline. “Building codes are a completely unsexy area, but they’re starting to shift,” Lara Fowler, an energy lawyer at Penn State, said. Fowler cited the Bullitt Center, the first net-zero building in Seattle, as an example that “paved the regulatory way” for future low or no emissions buildings. Green infrastructure and other building codes to reduce energy consumption can be used to further lower building emissions. The actions could face federal resistance. The UNFCCC accounts for non-national climate commitments through something called the Non-State Actor Zone for Climate Action, but it’s more of a showcase for those commitments than a formal mechanism. Nuttall said the United Nations is looking at ways to assess local climate action pledges more formally, including ways to measure how successful cities and states are at meeting their commitments. How states and cities proceed is crucial to determining the legality of their actions. Constitutionally, only the federal government can enter into treaties. States can set more stringent carbon pollution standards than the federal government, but those also come with risks. California, for example, has a waiver to set more strict auto pollution standards, which could be key in forcing automakers to sell more fuel efficient cars. The Trump administration has hinted that they could pull that waiver, taking away a key tool to reduce transportation emissions, which account for 27 percent of all U.S. carbon pollution. The Trump administration could also put up roadblocks to state and city action by threatening to withhold funding for infrastructure, environmental cleanup or other projects. That’s something the administration has already threatened to do with sanctuary cities that don't cooperate with immigration authorities, though Fowler said if that happens, states would likely sue the federal government in response. In the background of all this is the reality that clean energy is becoming cheaper. That’s reflected in commitments by corporations to going renewable and a number of states led by Republicans pushing hard for wind and solar power. Hart said getting those states on board with America’s Pledge or committed in other ways would only reinforce to the world that the U.S. is still all-in on climate action even in today’s currently polarized political climate. “If we can help Republican governors to talk about clean energy and build around that, it could be powerful,” he said.